This is the face of a bully. Sometimes things happen that make you take a hard look back and wonder where, when and why it all got started. The best I can remember, it started with the little girl in that picture, in the fall of 1965, standing in the yard outside Fairhope Elementary School. She has a somewhat shy smile, and doesn’t look mean, with that big bottom lip and chipped front tooth, right? Let’s take a closer look at the little girl in that photo. 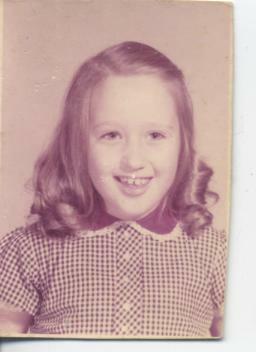 Her mother pin-curled her hair the night before picture day, but it was fine and the curls didn’t hold. The dress is out of style. The little girl is big for her age and on the chubby side. Already, they are starting to use hand-me-downs from her older sister and cousins across the bay. This little girl has an older sister who is nearly 10 and a brother who will be 4 in February. There is no public kindergarten in Alabama, so her mother has done her best to teach the child her ABCs, to spell her name and count her numbers all the way up to 25. When school starts, she is proud to learn she is not behind her classmates. The family moved back to Fairhope a few years earlier, and she plays often with another girl who lives four doors down the street. When school starts, she’s looking forward to seeing her friend. taller than the other girls. She doesn’t fit in with the other girls and her friend down the street has a new group of friends that does not include our little girl. She is hurt and confused. By the second grade, there are only 2 or 3 children who will play with her at recess and she eventually loses all interest in outdoor play. After all, the other children make fun of her attempts to play because she is clumsy, fat, slow and wears funny, ugly corrective shoes that keep her from being able to run. She becomes a loner and a book worm. What happens when you subject a shy, intelligent, sensitive child to ridicule, ostracization and teasing? They resort to some form of bullying. In my case, yes of course it’s me…I became sarcastic at the ripe old age of six. I built a defensive shield and struck back with words. I’ve continued to do so, sharpening my wits all my life. It has not served me well. My career has suffered. I have few friends. I eat alone every workday. I have no social life. My family, other than my sister, have essentially turned against me. All because I say things that hurt their feelings. Mind you, I don’t intend to do so. I’m acting defensively and often in jest, but it’s hurtful and once the words are said there is nothing to mend the hurt. Have I tried to change? Hell yes. I’ve been to DOZENS of seminars, read lots of books, seen counselors, taken drugs (prescription). Once formed, a person’s fundamental personality is–what it is. Now that my parents are dead, I have to accept that there exists only one person who loves me unconditionally, my darling husband. So it’s too late for me. Parents, please teach your little ones not to tease. Teach them to reach out to the lonely ones. Love the fat kids, the geeky kids, the ones with blemished skin and shabby clothes. Leave no child outside the circle. The bully they know is the the one they create. EPILOGUE: Since I posted this, on March 25, 2012, our sweet, tiny, and beloved mother died of a long struggle with breast cancer. I don’t think we’ll ever quite bury the bacon fork (subject for another post) but my sister and I have reached a stage through our grief where a few things just don’t seem quite as important as they used to. Other things, such as forgiving each other for things large and small, real and imagined, become very important in the grand pageant. If she reads this blog, I hope she forgives me. Do you have your bully with you this morning? Mine is sitting in my gut, curdling the cream in my coffee, and periodically tensing the trapesius muscles along my shoulders (my favorite stress indicator). My bully made me cry myself to sleep last night. I don’t know if my theories on bullies are borne out by scientific study, and, frankly, am too tired this morning to do the research. My theories are based on personal observation. Bully: a person of low self-esteem who gains self-worth by berating, abusing or physically assaulting weaker, younger or smaller individuals. I don’t believe, as some do, that all bullies fall into the typical “abuse begets abuse” pattern. I believe it all comes down to an issue of comparative self worth. A bully is someone who seeks to improve their own self worth by denigrating the self worth of someone else. You see, there’s where I contradict myself, because a bully can create other bullies. The victim of bullying can become a bully. My own particular bully is an older sibling. Since I was too young to comprehend or be present, I can only speculate on her formation, but I think parental berating along the lines of “why can’t you be smart like your younger sister” led her to begin verbally and physically assaulting me from the time we were pre-teens. I’m certain she has always resented my arrival 3 years into her existence as the darling only granddaughter/only child. I was cute, precocious and a little sister with whom she had to share EVERYTHING, including the affections and attentions of her parents. What 3-year-old is equipped to deal with that? As we grew, she became rebellious and challenged every constraint and rule and struggled in school subjects. I obeyed, learned from her negative examples, excelled at school, earned every badge at Girl Scouts and was the “good girl” in every respect. I bet it rankled her like hell on a hot Sunday. Well every family has sibling rivalries, and being punched by your older sister on a regular basis (and threatened with more punching if you told on her) is nothing unique. I survived it, and learned some valuable lessons along the way. This stuff hardly qualifies for the book-of-the-month club. I’ve managed a pretty good life: I graduated college, progressed through several high-paying careers and married two (consecutively) good men. Yeah, well, that feeds the bully. By succeeding, by having financial success particularly (and by making the parents proud) I lower her self-esteem by comparison. As long as I am away from home, safely 1000 miles removed, we can “love” each other over the phone. When I visit home, the physical proximity and inevitable comparisons apparently eat at her. The verbal assault begins. First it’s the shushing whenever I speak, even in a normal conversational tone. Then she starts to censor my speech. No relating stories about the past, especially if it is to share a funny story with a younger family member (it might reflect badly on her). Practically no subject is safe, in fact, so within a few minutes I’m left speechless. Oh, yes, I let the bully win. Why? Stay tuned.